Exhaust gas heat recovery (EGHR) is Dana’s latest thermal-management solution. It enhances cabin warm-up and speeds up coolant warming through exhaust gas energy, which would otherwise be wasted. 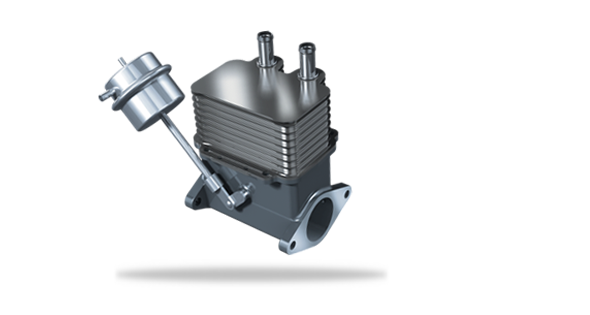 EGHR improves fuel efficiency by rapidly warming powertrain fluids, and thereby reducing friction. It accomplishes this by capturing the waste thermal energy to warm up the cabin and reduce parasitic losses in the engine, transmission, and axle. As coolant or transmission fluid moves through the unit, our uniquely configured EGHR unit recovers exhaust heat. With the EGHR unit in operation, exhaust heat is recovered and directed back to the powertrain components. For transmissions, the heat recovery system unit warms the coolant, which carries heat to the transmission oil utilizing active warm-up heat exchangers. The warm coolant can also be directed to the cabin heater core, warming the vehicle in cold temperatures. EGHR is a compact unit that is uniquely positioned within light vehicles exhaust system. By redirecting exhaust heat to warm powertrain fluids during cold start and ramp-up, EGHR provides a cost-effective solution that improves energy utilization.